Are you still dealing with the aftermath of that recent May hailstorm? You aren’t alone, as the preliminary losses are estimated at a whopping $1.4 billion according to the Rocky Mountain Insurance Information Association. With that said, it’s imperative that the steps you take now are properly calculated. In this blog post, we’ll give you our top tips for what to do after your house suffered recent storm damage. Take plenty of photos for proof – Keep in mind that this particular storm wreaked havoc on homeowners from Denver all the way up to Fort Collins, so your damage likely differs from others. It’s a good idea to take pictures of how your property looks, whether that’s obvious signs of roof damage or even outdoor air conditioning units that have been impacted. You may want to also look around inside the attic for signs of a leak. Get a roof inspection – Make it a point to contact a reliable roofing contractor prior to getting in touch with your insurance agent. The roofing company of your choice will walk your roof to assess if it has sustained hail damage to justify an insurance claim in the first place. Unfortunately, this is where many homeowners make a mistake in the process. Rather than do a bit of research and make a well-informed decision, they often trust a door-to-door solicitor claiming to be associated with a roof replacement company. File your insurance claim – Once you’ve met with a local roofer, it’s finally time to file your hail damage claim. Remember to have your homeowner’s insurance policy, as well as necessary facts and records handy when calling the claim number. Soon after, a claim examiner will assign an adjuster to make an official roof inspection and prepare a repair estimate. If May’s storm was any indication of what lies ahead, we may be in store for a hail-filled summer! Schroeder Roofing has been serving Fort Collins and Northern Colorado since 1977. From minor roof repairs to commercial roofing, we’ve been trusted as the area’s premiere roofing contractor. You can feel comfortable knowing that we’ve worked with all insurance companies in helping customers file and redeem their claims, making the recovery process quick and painless. Don’t hire just anyone claiming to be a Colorado roofing contractor. Instead, check out some of our residential roofing services. 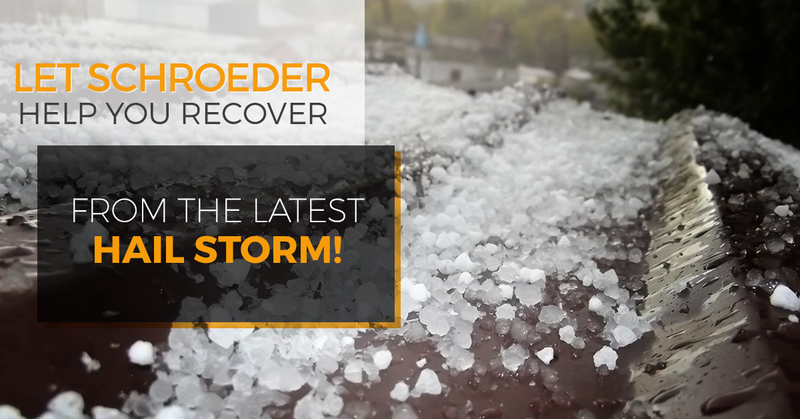 You may only think about your roof immediately following a storm, but the fact is that Schroeder does so much more besides hail damage repair! Now is the perfect time to get started on that roofing project that you’ve been putting off for years. We have unmatched expertise in asphalt shingles, tile roofing, metal roofing, and low slope roofing. If the recent hailstorm did a number on your roof and you want to start from scratch, we can walk you through the entire process. We’ve proud to be in our fourth decade of serving Colorado folks. Contact Schroeder Roofing today for your free consultation and cost estimate.